Mr. Helsinki Restaurant & Wine Bar is a phenomenal place with fabulous food and a great wine bar. The only wine and crepe bar that we know of in Door County. Read on and make Mr. Helsinki a definite stop for dinner, or late night desert crepe, and wine. You will be thanking DoorCountyNavigator.com for this lead! Simply put – the food is fabulous. 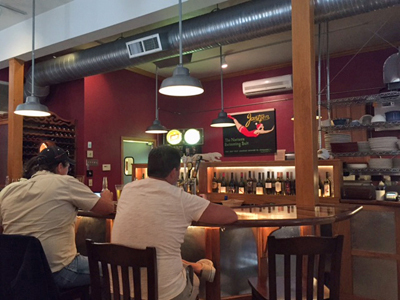 The atmosphere, up on the second floor (above the Fish Creek Market), is cozy, classy, and cool. Artwork adorns the walls and is for sale. Open for dinner only, Chris, the owner, is totally focused on first-class food offerings that you will flip over. You can get appetizers (like duck lettuce wraps, crab cake sliders and more), salads, ½ pound, grass-fed beef hamburgers, and their specialty: crepes. Dinner crepes, desert crepes. Oh yum! Crab Cake Sliders: a plate of 4 toasted bread slices with a crab cake concoction atop, and a fabulous, somewhat spicy, sauce. To die for. They were called “sliders” but they are not on a bun. No tops on these. But order them. They are out of this world delicious. Ask for more sauce. 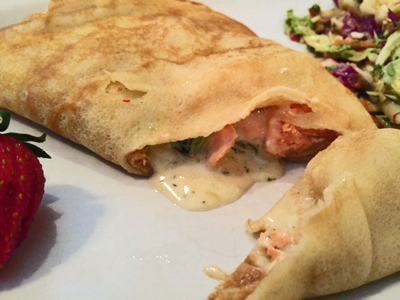 Salmon & Asparagus Crepe: comes with a slide of cole slaw and an artfully sliced strawberry. Cut into the crepe and out oozes this wonderful creamy sauce, and the chunks of sockeye salmon sautéed with asparagus, chives, dill, cream and locally made cow's milk cheese – are there waiting for you to savor. Take your time. Do not rush through this. Savor each bite. It is worth it – trust us. Creole Crawfish Crepe: with a side of slaw, strawberry. Crawfish tail meat sautéed in a white-wine cream sauce spicy Creole blend, Asiago cheese and veggies. Reviewer rating: 5 stars. It was superb. Banana Foster Desert Crepe: our choice the last outing was their famous Banana Foster crepe: Caramelized bananas flambé with rum over a chocolate crepe and topped with vanilla custard – and it is wonderful. Wonderful. Wonderful. Get it! When you finish it you will want more. Our wait person, Jave (who has waited on us countless times) is just terrific. We have dined here many times, had reviewers dine here many times, and it is consistently delicious. We have had virtually all of the desert crepes, including their new one, salted caramel. All delicate and delicous, but Banana Foster remains our favorite. As we alluded too, a diverse selection from luscious appetizers, salad sides (like a watercress, endive and arame seaweed in a miso vinaigrette), the burgers (like a blue cheese and grilled Neuske’s smoked ham – this ham is tops), the dinner and desert crepes, and some featured entrees. You can check out the entire menu here. You will be amazed at the choices and the quality. Their wine selection is also admirable with about 40 offerings by the glass (in red or white), or bottle (ranging from $7.50 - $14 a glass, up to $44 a bottle), a couple of roses, and some sparkling wines, and then some “reserve” wines offered only by the bottle, ranging from $40-$195 a bottle). Remember – you can stop in just for some wine, sit at the wine bar in the evening and enjoy an extensive section to top off your evening after the theater. Head to the Fish Creek Market on Main St (Hwy 42) in Fish Creek (go to 4164 Main Street) enter the doorway, turn left and head up the stairs to Mr. Helsinki’s – very easy to miss. Seven tables or so, gentle jazz playing backup, wooden slat blinds on tall windows, decorative carved wooden screens as room dividers, rust-colored walls and original art you can by right off the walls makes this a cozy, comfortable, casual, yet sophisticated place. The staff is courteous and attentive. Step up to the bar and order then take a seat. This is one great place to unwind, chat and just relax. You can also get special imported beers, and wine, bottled water and other items to tempt your pallet. But get a crepe – they are fluffy, and stuffed. We enjoyed the strawberry crepe, and a cup of coffee, and a bottle of water. The bill was about $8.00 for these items. 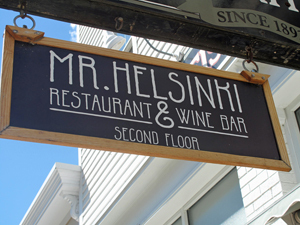 We at DoorCountyNavigator.com highly recommend Mr. Helsinki Restaurant & Wine Bar. We know you will love it. Go there, and please tell Chris that DoorCountyNavigatort.com sent you!